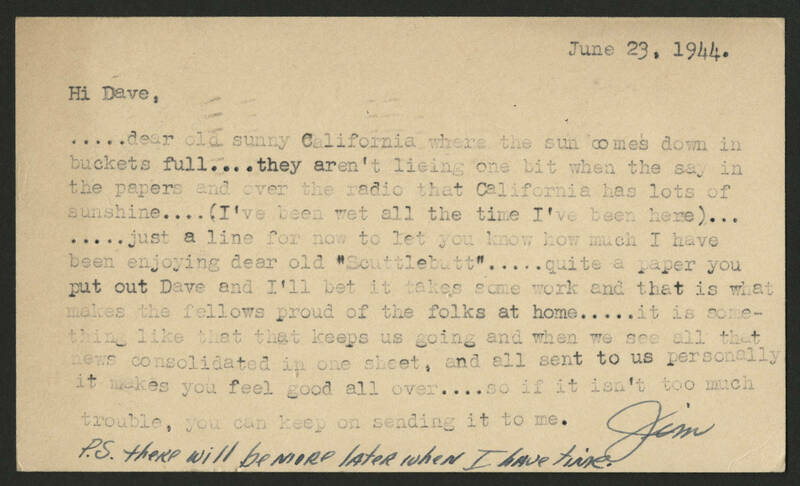 June 23, 1944 Hi Dave, .....dear old sunny California where the sun comes down in buckets full.....they aren't lieing one bit when the say in the papers and over the radio that California has lots of sunshine....(I've been wet all the time I've been here)....just a line for now to let you know how much I have been enjoying dear old "Scuttlebutt".....quite a paper you put out Dave and I'll bet it takes some work and that is what makes the fellows proud of the folks at home......it is something like that that keeps us going and when we see all that news consolidated in one sheet, and all sent to us personally it makes you feel good all over....so if it isn't too much trouble, you can keep on sending it to me. Jim P.S. There will be more later when I have time.